The lucky winner, chosen by Random.org, was #22! Congrats to you, AIMEE! She will be receiving the two products she chose: Laundry Liquid and the Auto Dish Powder! If you are interested in purchasing their products containing sustainably sourced plant and mineral based ingredients, Ecostore USA offers FREE SHIPPING with any order over $25! No code needed, simply add the items to your cart and the savings will be reflected at checkout! Another great deal for the month of July, head to coupon.com and type in your zip code! If you live in a state with a Meijer store you will see an Ecostore USA coupon that gives you a third Ecostore USA product for only $.75! Also, Lyne Appel Downing, the V.P. 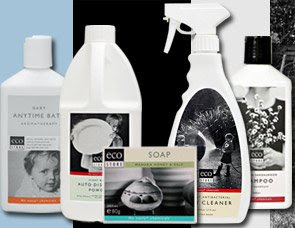 of operations and sales at Ecostore USA, will be attending BlogHer09 in Chicago! If you'll be at BlogHer 09', please look for Lyne or give her a tweet to let her know where you are and how she can come say hello!